Hey there lovebugs! Its the best day of the week: Friday Foodday. Remember if you want to include your recipe just email, comment or tweet it to me! Meanwhile, in a large skillet, cook beef over medium heat until no longer pink; drain. Stir in marinara sauce, tomatoes, and seasonings. Bring to a boil. Reduce heat; cover and simmer for 5 minutes. Drain tortellini. Add tortellini and sauce mixture to oven-safe dish and top with cheese. Bake at 350 degrees for 5-10 minutes, or until cheese has melted. One of the easiest recipes in the world and so delicious. Preheat oven to 350. In a large bowl combine the sausage, bisquick and cheese. 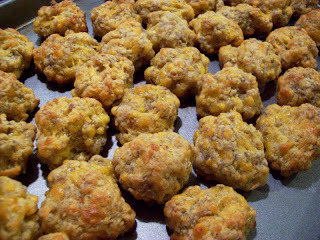 Form into small balls and place on baking sheets. Bake for 10 minutes until golden brown. broiler for a few minutes before serving to give it a crispy, golden topping. You could even try adding a grated hard-boiled egg or cooked prawns, but I like the simple style, as here. 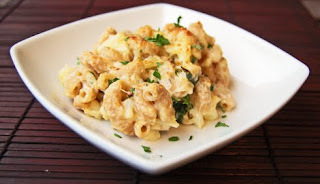 To prepare your pasta: Remove the outer green leaves from the cauliflower and discard. Slice the end off the cauliflower stalk and cut the head into small florets. Halve the thick stalk lengthways, then slice thinly. Grate the Cheddar and Parmesan into a large heatproof bowl. Finely chop the parsley stalks and leaves. To cook your pasta: Bring a large pan of salted water to a boil. Add the macaroni and all your cauliflower and cook according to the macaroni-package instructions. Place the bowl of cheese over the saucepan and add the crème fraîche. Carefully stir every so often until the cheese is smooth and melted. If the water boils up beneath the bowl, just turn the heat down slightly. Add all the chopped parsley to the melted cheese and season with a pinch of salt and pepper. Carefully remove the bowl of cheese using a towel or oven gloves and put aside. Drain the macaroni in a colander over a bowl, reserving the cooking water. Return the pasta to the pan, pour in the melted cheese, and stir. It should have a lovely, silky consistency, but if it’s too thick for you, add a splash of your cooking water to thin it out a bit. At this point you can either serve the macaroni as is, or finish it under the broiler to make it crispy and golden on top. To do this, preheat your broiler to a medium to high heat. Transfer to a baking dish. Place under the broiler until golden and bubbling. 1) Compile all the ingredients for your box mix and follow directions. Make batter and fold in ½ cup of chopped walnuts and ½ cup of dried cranberries. Bake. 2) For frosting: Let the cream cheese sit at room temperature while pumpkin bread bakes. Combine cream cheese with honey, vanilla and sugar and combine until smooth and slightly fluffy. 3) Let bread cool completely and spread a thin layer of frosting on top of the cooled bread. Let sit for 10 minutes (this is called the crumb layer because it shields the rest of your icing from looking “crumby”). 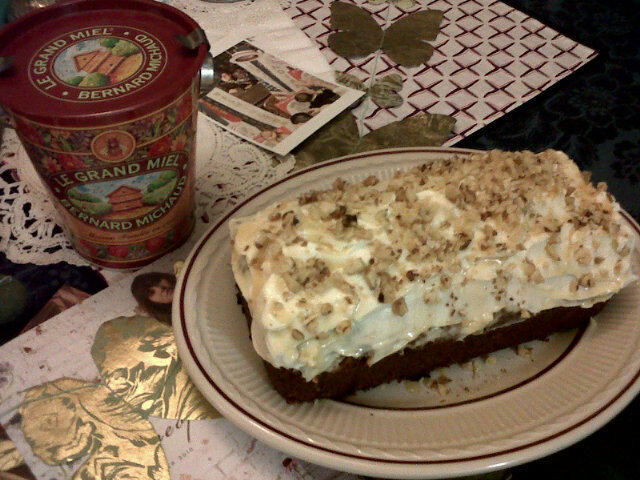 Once set, put the reminder of the icing and ¼ of chopped walnuts and drizzle honey on top. Today as is my final day with the left foot I was born with. Dramatic? Yes. Lies? Nope. As I mentioned yesterday, tomorrow I will have a bunion removed from my foot. Now for those of you who are wondering what will happen, I will tell you. Or I'll just tell you anyway because I want sympathy. They will break the base of my big toe bone and shave off the excess bone. Super gross. I'll be in a really stylish walking boot for 30 days and hopefully will not need crutches. I've read it's a fairly painful recovery so let's give a big round of applause to the BF for his future nursing dedication to me over the next week. Wooooohooooo! Today's post is dedicated to beautiful heels. 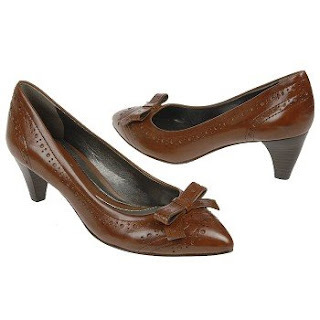 Dressy heels, casual heels, work heels, kitten heels, all heels. Wear them proudly, roll your shoulders back and embrace your beauty in heels. Heels that I too will wear with you ASAP. 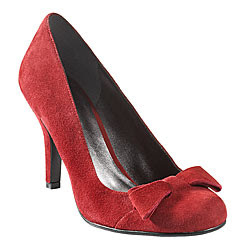 never underestimate the power of a good kitten heel. Especially one with this much personality. Very Mad Men. Chic, Professional with a mod flare. 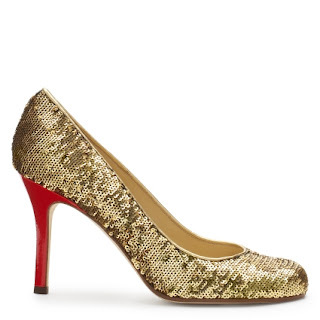 This shoe is dying for a mini skirt. Can we all visualize this with a chocolate brown cord skirt and a chunky knit white sweater? Oh yes. This weekend I was reading my Elle when I came across a great new trend that I love. Parisian prep. Of course I loved all of Elle's suggestions but spending $450 on a cardigan is just a touch out of my budget. So I wanted to give you all some ideas on what I had in mind on a more TCB related price point! I really like this cardigan because of the v-neck. And the bow is outlined in sequins! As the title suggests: seasonless. It should also say timeless. Wait what? 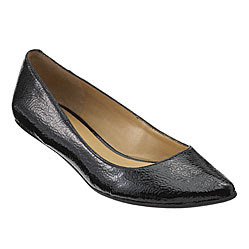 Naturalizer, like the old lady shoe? Yes. 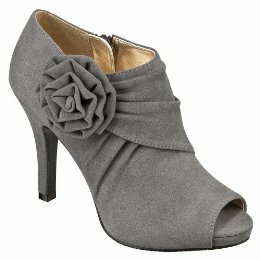 Look at the detailing and the bow and the kitten heel. Yes! Simple and elegant, also a great waist hem so it doesn't cling. Now, before you read any further, I would like to caution you with one thing: please please please if you want to know more about what a bunion is, do not, for any reason whatsoever, google image bunion. OMG it is so gross to look at people's nasty feet. Please, stick to WebMD and the like. So, Wednesday, I will be having surgery on my foot to remove a bunion. Why? Well one because it hurts like crazy and two because I haven't been able to fit my foot in a heel for months. So sad. For today's bunion watch post I wanted to show you why this surgery is important. This is a shoe I would love to wear with a black pencil skirt patterned tights and a white cardigan. But I can't because my foot just hates me. It's fine. But that's just it. It's just fine. Nothing wow about it, just gets the job done. So, surgery is Wednesday. Get ready. Happy Friday Foodday lovebugs! I hope you all have a fabulous weekend and I can't wait to talk to you again next week. Remember you can always submit your recipes by email, comment or tweet! Preheat oven to 390 F. This can be made as muffins or bread. Whichever your fancy, grease the appropriate pan. In a large bowl, mix the dry ingredients. In a medium sized bowl, blend remainder of ingredients until well mixed. Stir into dry ingredients until just blended. FIll prepared pan/muffin tins with batter. Bake muffins 15-18 minutes. Cool in pan or on a wire rack. To make a simple glaze, combine 1 cup powdered sugar with 1 1/2-2 Tbsp milk. Stir thoroughly and drizzle on top of muffins. PREHEAT oven to 425ºF. 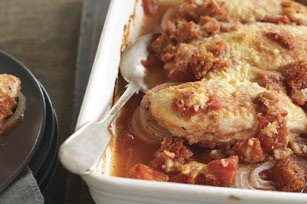 Place onions in bottom of 13x9-inch baking dish; top with chicken. COMBINE tomatoes, dressing and garlic powder; pour over chicken. Sprinkle with cheese. BAKE 30 min. or until chicken is cooked through (165ºF). 1. Place pizza stone or baking sheet in center of oven, and heat to 425 degrees F.
2. Melt 1 1/2 tsp. margarine in skillet over medium-high heat. Add mushrooms and cook 4 to 7 minutes, or until beginning to brown, stirring frequently. Add broccoli and 1/3 cup water. Cover tightly, and steam broccoli in skillet 3 to 4 minutes, or until tender. 3. Meanwhile, heat remaining 1 1/2 Tbsp. margarine in saucepan over medium-high heat. Add flour, and cook 2 minutes, or until pale golden, stirring constantly. Stir in milk, garlic and salt. Cook 3 to 4 minutes, or until mixture thickens and begins to boil, stirring constantly. Remove from heat. Stir in 1/4 cup mozzarella and 2 Tbsp. Parmesan until sauce is smooth and cheese is melted. 4. If using homemade dough, shape pizza dough according to package directions. Remove pizza stone from oven, and place dough on hot stone. 5. 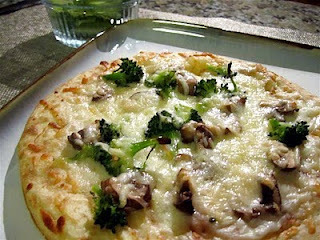 Spread white sauce over dough to within 1/2-inch of edge, and top with broccoli mixture. Sprinkle remaining mozzarella and Parmesan over top. Return to oven, and bake 18 to 20 minutes, or until edges of pizza are golden and center is hot and bubbly. Cool slightly before slicing and serving. Have you sent in your recipe for Friday Foodday? What are you waiting for? Do it! Last night I went a bit overboard at the Ann Taylor Loft sale. Surprise? Nope, not at all. Especially with 50% off sale items. Hello? 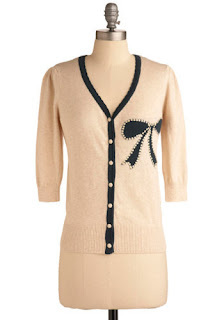 Anyway, my favorite item I got was a blush colored sweater dress with belted ribbon. I can't find a pic online but its adorable! $30 with black tights and I'm looking so put together with so little effort. So today I wanted to talk about sweater dresses as they are a great staple for fall and winter. My big warning with sweater dresses: they show everything. Every bump, roll, pudge, pantyline, everything. So please, if you need to go up a size so it doesn't cling- do it. You'll be doing the world a favor and it will look so much better on you. I like the big sleeves on this dress. You cold even remove the belt and use a ribbon of your choosing or a leather belt! I love this for the weekend. Be careful with your jewelry choices though- those are thick stripes, don't try to get fancy with them! This dress has got great lines. Nothing clingy, just very clean. 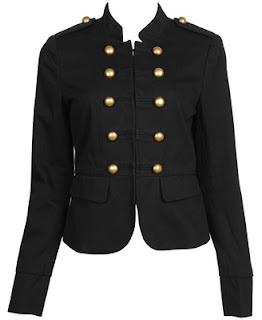 I'd love this with heels. Don't let the hem past your knees, if needed get it tailored! Um hi there perfection, my name is Kelsey. Please meet my brown suede J Crew riding boots and we will live happily ever after! I am loving this dress. The pocket placement is perfect and it is such a versatile item! 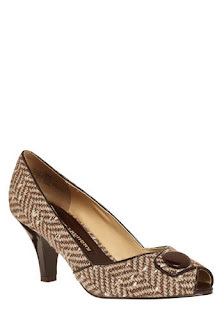 Pair with black boots, brown oxfords, you name it. Have fun with this one. final point: if you think it might be a little bit too short for work....it is.